The use of stone slates is unusual in south-east England but in West Sussex the Horsham Sandstone in the Wealden Clay has a very long history as a roofing material. The roofs for many early buildings were dug from immediately alongside the site - also providing the duck ponds which are so often seen in the area - but gradually an industry built up around Horsham. Sometimes the stone was worked for its own sake, at others to get at the ironstone beds. HORSHAM SANDSTONE is the principle stone of this belt. It outcrops in a semi-circle from Crawley to Horsham and south-east to the Brighton District. North of Horsham it is present as a single seem which divides into two towards the south. Thin clays separate the distinct beds which have variable fissility and are more or less calcareous. (Some stones may even be described as sandy limestones.) As is usual with roofing stones it is near surface weathering which has made them fissile but in this area the upper bed is often so weathered and decalcified and is not suitable for building purposes. The middle bed is ripple surfaced and splits thinly. The massive lower beds have usually been crushed for aggregate. 1 What] Slating is the Covering of Houses with slate. This kind of Covering is very neat, especially the Blue-slat; as for the other kind of Slate (known in some Places by the Name of Horsham-stone) See Horsham-stone. The Blue-slate cut into long Squares, or Escallops, shews very handsome, and is commonly us'd in Covering of Summer, and Banquetting-houses in Gardens; it being a very light and lasting Covering. But as this kind of Covering is very handsome, so also 'tis very chargeable; for Roofs cover'd with Slate, must be (first) boarded over, the Slates hanged on Tacks, and laid with finer Mortar than Tiles. But if these Slates be rudely cut, and carefully laid (with respect of Form) it is then accounted a cheaper Covering than with plain Tiles; especially in those Countries where the Earth affords plenty of them. 2 Price of] This kind of Covering is valued by some from 3s to 6s the Yard square, or by the Square of 10 Foot, (that is 100 Feet) from 30s to 3 pounds, or more in some places. 3 Price of Pointing of Slates] The Pointing of Slates (that is hewing them, and making them fit for the Work,) is worth (says Mr Wing) about 12, or 13d per Square. 4 Prices of Slates] Slates at the Pits (says Mr Wing,) 12 or 14s per Thousand which will nearly do 36 square Yards. 5 Of Measuring] Slating in some places is measur'd by the Rod of 18 Foot Square which contains 324 superficial feet, or 36 square Yards. In measuring this sort of Work, where there are Gutters or Valleys, there is commonly an allowance, which is to take the length of the Roof all along the Ridge; which makes the Gutters double Measure, viz. as much more as really it is; which in some places is allow'd, and in others not; which depends upon the Custom of the Place. 1 What] Is a kind of thin broad Slate of a greyish Colour much used in some parts of Sussex formerly, not only to heal or cover Churches and Chancels but some great Houses also; it is call'd Horsham-stone in that County, because it is for the most part brought from a Town there called Horsham; this sort of Stone, or Slate rather, is laid of different Sizes, viz. From 8 or 9 Inches. to 24 Inches, or more in length, or breadth etc. It is commonly from 1/2 Inch, to 1 Inch thick. 2 Of the Price of Horsham-stone.] The value of them is according to the distance from the Quarry, viz. From 10 to 20s. per Load, I have known a Load of them laid in for 17 or 18s. at 13 or 20 Miles distance from the Quarry. A Load of these, (as I have been inform'd by those that have made some Observations on this Matter,) will cover about ¾ of a Square. point it, not less than 6 or 7s per Square, which is the lowest I ever knew it done for. 5. Of the Properties of this sort of Covering.] From what hath been said before, you may easily gather that this fort of Healing is dearer than Tiles; for the Charge of a Square of Tiling, is from about 23s. to 30s. or some will have it from 24 to 28s. per Square; where I find by Calculations from some Observations, a Square of Healing with Horsham-stone, will be worth from 32s to 38s. And besides for this sort of Covering. the Timber for the Roof, ought to be considerably stouter and stronger, because a Square of this sort of stone is almost as heavy again as a Square of Tyling. Now that which I suppose to be the cause why these Stones have been so much in use for Churches, etc. must be, because they are far more durable than Tiles; which makes some Recompence for the Charge; for some say these Stones are very durable, being for the most part very hard, so that no Weather will do them any hurt, as it will Tiles. Constructional details are similar to other large format stone slates although the pitch is usually steeper, often more than 45 degrees. Most commonly the roof is gable to gable but hips and valleys are frequent. The latter are soakered and pointed. Valleys are either close mitred or open and lead lined although these are probably not original details. Dormers are rare. Abutments are finished with either lead or mortar flashing over lead soakers. A list of remaining Horsham stone roofs is being compilied by the Domestic Buildings Research Group (Surrey). Because of difficulties in getting the large and uneven slates to lay correctly spot bedding with breeze has been used. The use of shadows is also commonplace to improve the weathering where slates were excessively shouldered. Following the demise of the quarrying industry and as supplies of reclaimed slates diminished the use of shadows became extended until the head lap was too small to be effective. In extreme cases the construction is no longer double lap and the shadow slate is used to weather the perpendicular joint. In effect the shadow has become a soaker and the system is single lap. This technique is known for other slates (Caithness) and in other situations (Economy Slating in the USA). Whether it is now so well established in this region that it should be regarded as traditional and so should be conserved is debatable. There have been many problems in re-slating Horsham roofs mainly do to confusion between the two systems and use of unsuitable mortar. A guide to slating in the region is available here. 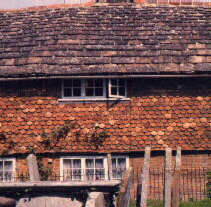 The techniques adopted to extend the small amount of Horsham stone slates that are left may have helped the survival of the local roofscape but without a supply of new stone slates eventually all these roofs will disappear. Recently a quarry producing roofing has started opperation - Historic Horsham Stone Co.